For this month's Table for Two, I'll be chatting about Squish Marshmallows and Alexa is featuring Barn Joo. 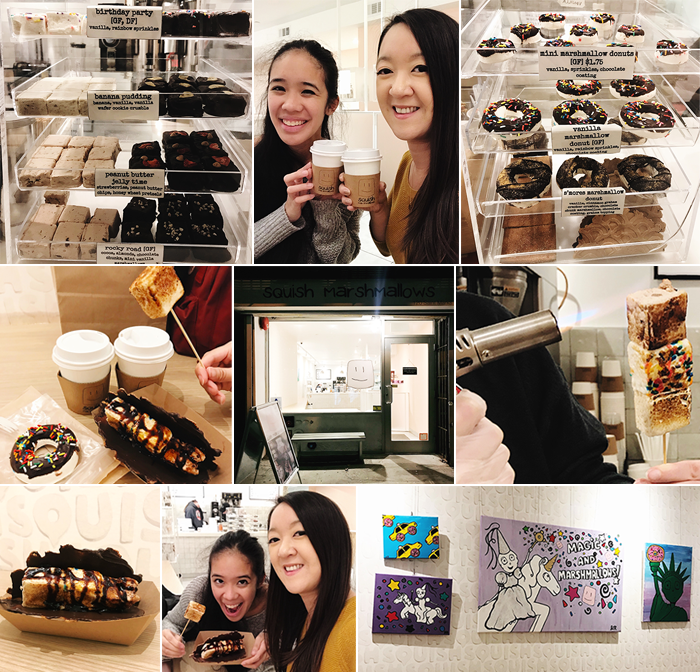 Squish Marshmallows is a new-ish sweet shop near East Village that focuses on – you guessed it, marshmallows! The store itself is cute and fun. Bright lights and fun artwork on the walls. But as you can imagine, Alexa and I zeroed in on the displays of marshmallows and the different things we could order. Since we wanted to try a little bit of everything, we got: a s'mores taco filled with melted birthday party, rocky road and s'mores marshmallows; one melted banana pudding marshmallow, a vanilla marshmallow donut and hot chocolate. My favorite was definitely the taco (or even the single marshmallow) because it was melted goodness perfect for a cold night. Plus it was cool watching them heat it up in front of us! And even though I'm not a hot chocolate person, theirs was delicious. All in all, it's a great dessert spot for winter. So if you're in the city, I would definitely recommend it. You can find Squish Marshmallows at 120 St. Mark's Place. Let us know if you check it out!